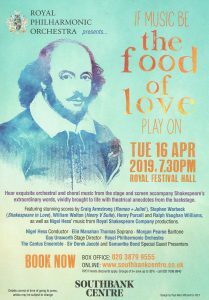 This April 16th Sir Derek Jacobi and Samantha Bond present The Food of Love, a concert of exquisite orchestral and choral music from the stage and screen, accompanying some of the Bard’s most famous speeches alongside scandalous anecdotes from the backstage in Southbank Centre’s Royal Festival Hall. Vividly brought to life are stunning scores by Craig Armstrong (Romeo + Juliet), Stephen Warbeck (Shakespeare in Love), William Walton (Henry V Suite), Henry Purcell and Ralph Vaughan Williams, as well as Nigel Hess’ music from Royal Shakespeare Company productions. We have a pair of Free Tickets that will go to the contributor of the best Love Food Recipe....just add a comment here and tell me what you cook / eat / dribble over as part of Valentine’s Day in your house.